“The President’s Own” Remembers George H. W. Bush - USA Patriotism! As the nation mourns the passing of one its finest patriots, current and former members of the Marine Band remember President George H. W. Bush as a man whose love of music and uncommon graciousness elevated the unique relationship between the Chief Executive and “The President’s Own”. Master Gunnery Sgt. Peter Wilson, violinist and current string section commander, joined the Marine Chamber Orchestra in 1990, halfway through President Bush’s term. What impressed him about the president was that he always made a point to go out of his way to acknowledge and thank the musicians for their participation at assorted events, even if it meant shaking off his handlers to seek out the orchestra. It was during President Bush’s tenure that Wilson and several other musicians founded the Free Country ensemble and one of their early performances was at President Bush’s daughter Dorothy Bush’s wedding to Robert P. Koch at Camp David on June 27, 1992. In addition to Free Country, the Marine Band provided a brass quintet in the chapel for the ceremony and a dance band for cocktail hour. After the event, as the musicians packed up their instruments to leave, President and Barbara Bush found them to shake each of their hands, ask their names, and thank them for their music. Wilson said from that day forward, President Bush remembered his name and called him Pete each time he saw him at the White House. “He had an amazing ability with names and people,” Wilson said. At a congressional picnic Wilson was singing with Free Country and he recalled President Bush seemed to appear from out of nowhere and shook hands with each of the musicians as they performed. Wilson considers it a point of pride that he was able to greet Bush and not lose a beat during the fast-moving lyrics of Billy Joel’s “Travelin’ Prayer.” It was another event, however, that Wilson can never forget. 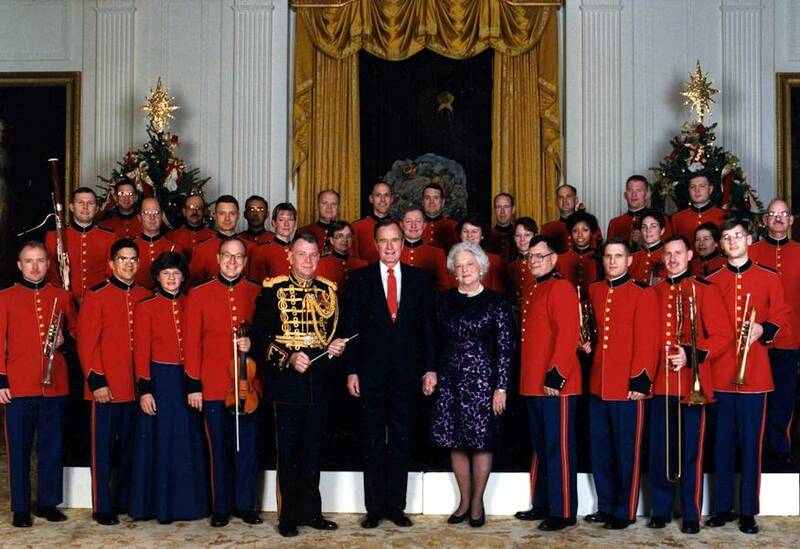 The Marine Chamber Orchestra was performing at the White House on Jan. 16, 1991 and President and Mrs. Bush were greeting visitors in a receiving line. Wilson noticed then-Chairman of the Joint Chiefs of Staff General Colin Powell walk up to the president in his green service uniform to pull him away. Bush didn’t come back to the event. When Wilson returned to Marine Barracks Washington, the news on the television in the lounge was reporting the first bombing attacks on Baghdad and the beginning of Operation Desert Storm. “I will always remember President and Mrs. Bush as being unfailingly gracious, kindhearted and appreciative toward the members of the Marine Band,” recalled Former Director Col. Timothy W. Foley, USMC (Ret.). The Marine Chamber Orchestra, conducted by Col. Fettig, will perform one last time for President Bush at his funeral service at 11 a.m., Wednesday, Dec. 5 at the Washington National Cathedral in Washington, D.C. Selections include Gustav Holst's Nocturne from A Moorside Suite, Kevin Siegfried's arrangement of "Lay Me Low" from Shaker Songs, Aaron Copland's Our Town, Paul Christiansen's arrangement of "My Song in the Night," John Williams' Hymn to the Fallen, and Samuel Augustus Ward's "America, the Beautiful.